We’d love your help. 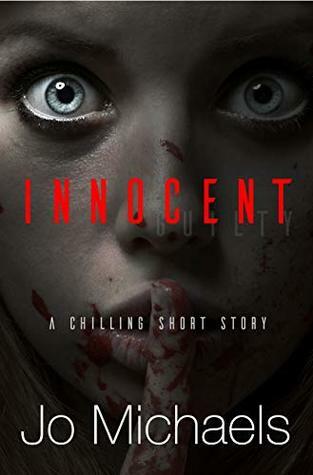 Let us know what’s wrong with this preview of Innocent by Jo Michaels. To ask other readers questions about Innocent, please sign up. I must admit, I don't really get it. I just couldn't wrap my head around it. It's too confusing, it makes no sense.. I am as baffled as the protagonist is! Is she innocent? I don't bloody well know. I'm left with more questions than I started with. As if I expected anything less, Jo Michaels has written another gripping novella. Innocent is told from the point of view of a woman who is trying to prove her innocence in a warped reality. I loved the main character’s thoughts. She was a but sarcastic and frantic, and it made question her innocence and guilt with every page. The story is fast-paced and Jo Michaels creates this sense of tension and confusion which puts the reader right into the story. I found myself questioning what was real and As if I expected anything less, Jo Michaels has written another gripping novella. Innocent is told from the point of view of a woman who is trying to prove her innocence in a warped reality. The story is fast-paced and Jo Michaels creates this sense of tension and confusion which puts the reader right into the story. I found myself questioning what was real and what wasn’t. I highly suggest checking this quick read out. It’s a rollercoaster and it will leaving you wondering what was real and what wasn’t. This is definitely one of my favorite reads of 2019. So I’ve read the first book in this series, Emancipation so when I saw this book come up I jumped at the chance to read it. I loved Emancipation, it was gripping, full of twists and turns I didn’t see coming and this story was no different. Thought this book is the 5th in the series, you don’t have to read the others to understand it. This was a super quick read and I wish there was more to the story because it had me gripped from page 1. I couldn’t put it down, I had to keep reading to find out So I’ve read the first book in this series, Emancipation so when I saw this book come up I jumped at the chance to read it. This was a super quick read and I wish there was more to the story because it had me gripped from page 1. I couldn’t put it down, I had to keep reading to find out what was going to happen next. Jo Michaels weaves a fascinating story, full of detail and suspense. A psychological thriller where the narrator is trying to prove her innocence in what becomes a warped reality. Clever, embedded with doubt, and set at a frantic pace. The story was over too quickly. I needed more! Guess that’s why it’s called a short story. Jo Michael is a genius when it comes to the Pen Pal and Serial Killers series. Her sick and twisted mind is phenomenal. Can’t wait for the next book of the series. First book I have read by this author. Interesting gripping twists and turns suspense. Normal night at home she is peeping at her neighbors across the way. She witnessed something. She calls the police but No one can come.She has to go to the officer. Things escalate from there. This book was interesting the ending left me hanging . I was hoping for so much more. Still an interesting little mystery. Three and one half stars (due to the abrupt ending). I chose this short story via Amazon Kindle. The cover and most of all synopsis intrigued me. I still think I know who the murderer is, but I'll leave that for you decide on your I own. Good book, but has potential to be even better. Jo Michaels is excellent at pulling me in one direction and then, boom, something completely unseen happens. This is a tremendous example for anyone who hasn’t read the Pen pals and Serial Killers series! This book was fun! The mystery and snark. I loved every bit of it. Thriller fans you won’t be disappointed. What an intense hour! That's all it took to read this, if even that long. So gripping! I could not put it down. While it is book 5, you really don't have to read anything prior to enjoy this. Before you jump in know this is a short story - The kind that gets the reader fully engaged, sets up all kinds of questions then even with a closing leaves you asking yourself Huh? Who? And a bit upset you What a fun way to get a taste of an author's writing style. 3.5-4 stars! Very interesting read with some twists! I received a free copy to review, but when I saw it was also free on Amazon, I picked up another copy just because I wanted to support the author. I didn't realize this was a short story going into reading, so I was definitely in for a shock. At first, I really liked the character's wit and banter with the reader. As time went on, though, it became annoying and almost like a mechanism to be able to jump around too much in the story. While the premise was quite interesting, I was often confused by I received a free copy to review, but when I saw it was also free on Amazon, I picked up another copy just because I wanted to support the author. At first, I really liked the character's wit and banter with the reader. As time went on, though, it became annoying and almost like a mechanism to be able to jump around too much in the story. While the premise was quite interesting, I was often confused by how the story was unfolding or why the main character was acting or not acting in a certain way. Jo Michaels loves writing novels that make readers gasp in horror, surprise, and disbelief. While her browser search history has probably landed her on a list somewhere, she still dives into every plot with gusto, hoping "the man" will realize she's a writer and not a psychopath about to go on a rampage. Her favorite pastimes are reading, watching Investigation Discovery, and helping other authors Jo Michaels loves writing novels that make readers gasp in horror, surprise, and disbelief. While her browser search history has probably landed her on a list somewhere, she still dives into every plot with gusto, hoping "the man" will realize she's a writer and not a psychopath about to go on a rampage. Her favorite pastimes are reading, watching Investigation Discovery, and helping other authors realize their true potential through mentoring. She's penned the award-winning Pen Pals and Serial Killers series and the best-selling educational book for children, Writing Prompts for Kids, which has rocketed the kids that use it into several awards of their own.